Could trains come back to Pant and Llanymynech? Recently, there have been some press reports about the possibility of reopening the railway between Welshpool and Gobowen. Before the Beeching cuts, the line linked Pant and Llanymynech – as well as Llynclys – to Gobowen, Welshpool and beyond. Now, there are calls for a feasibility study to be commissioned to build the case and assess the viability of reopening the old line. Could Pant once again get a train station thanks to the Welsh Government? In this piece for Pant.Today, Helen Mary Jones, Plaid Cymru AM for Mid and West Wales, outlines the case for a reopening of the old line between Welshpool and Gobowen. “More than half a century after its closure, the line from Welshpool to Gobowen remains unused and relatively free from development. It poses a clear opportunity for the Welsh and UK Governments to improve the public transport network, and create more prosperity in the region. Aside from the economic and environmental benefits which would come with such a project, this line would greatly assist those in need of regular access to both Gobowen Hospital and the Wrexham Maelor Hospital. 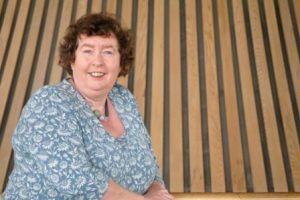 This could be part of the Mid Wales Growth Deal or a broader Welsh transport strategy, these links would provide a much-needed lifeline to people living in the area who need access to important healthcare services. I am campaigning with my Plaid Cymru colleague on Powys Council, Councillor Elwyn Vaughan, for a study into the reopening of the rail line. This is a key issue when public transport is a lifeline for so many people in Wales, some of whom live with no access to a car as a means of transport, they are left reliant on the public transport network for all of their travel. A switch to better rail links would cut congestion and pollution on our roads. The Labour led Welsh Government should improve rail links, such as this one, to update the antiquated transport system. We also need the UK Government in London to provide much needed funds to boost our rail links. We have seen the possibilities available if we re-establish the rail link between Aberystwyth and Carmarthen, following the publication of a technical feasibility study. This study was supported by Plaid Cymru. That report has published a route and costings for the plan as well as an outline of the environmental and economic challenges to be overcome, including a cost of £775 million. How would it be possible when two families (one running a business) have built homes directly on the line in Pant? There are several properties built on this land which was sold quite legally.